This book was just what I needed after my string of amazing Giller reads. Engaging, but completely different. In 2006, when Sara Jewell’s marriage ended, her first thought was to go to Pugwash, a small community in Cumberland County Nova Scotia where she had spent her summers as a child. She ended up staying, and Field Notes is made up of essays and observations about rural life seen from the eyes of someone who has lived most of her life in the city. The book is divided into four thematic sections, and includes essays on everything from Maritime kitchen parties to funerals for mice. She writes about the people who make up the surrounding area, as well as the animals and landscape that are the background to their lives. Made up of more than 40 essays, it’s impossible to talk about them all, but there were some topics that stood out for me, or had me nodding my head in familiarity. 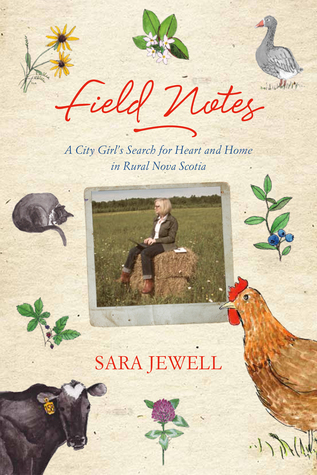 Sara Jewell married a man from rural Nova Scotia. I married a man from the city (Halifax). So I recognized in her some of what my husband experienced when he moved out of the city with me for the first time. For example, it is a requirement for everyone to wave at each other. Not only do I automatically wave at everyone, but I sometimes wave to them more than once – when I see a neighbour getting into their car and again when they’re driving off down the road. My husband has diligently practiced his hand-waving skills over the years and now seems to enjoy his perfected two-fingered wave to other vehicles as they pass. I know from my past life as a vacationer that waving freaks out visitors. That person from Ontario could have spent the rest of his or her vacation trying to figure out who they knew in Cumberland County, Nova Scotia, because someone waved at them. Talking about the weather is another favourite Maritime activity. It’s hard to have a conversation with someone around here without the weather coming into it. Around here, small talk = talking about the weather. Sadly for me, not books. In a world where locations, likes and preferences, meals, and workouts are recorded – and where storms are tracked weeks in advance – to have the natural world operating above and beyond our control is exactly what we need. In our universe, weather remains supreme ruler no matter how many attempts we make to overthrow its regime. I love her observation that “rollators should come with snow tires”, as she watched on two different occasions older women determinedly plowing through snow on the sidewalk to get to their destinations; not letting a little bad weather get in their way. Sara (I feel like I can call her Sara) writes about the importance of community, and the decline of church congregations and community events as being detrimental to small communities and the connections that are so important to keeping them alive and well. Our rural communities are no longer filled with people in their thirties and forties who are starting families and putting down roots. While that is reflected most obviously in church pews, it’s also apparent in the readership of local newspapers, and attendance at local events like pancake suppers, craft shows and concerts. She writes of rug-hookers and fiddlers, old dogs and new puppies, walks in the woods and the death of trees. (Even more devastating than the essay on road-kill is the one about old dogs – don’t say I didn’t warn you!) And I have found someone else with a strong desire to own a goat. I think we could be friends. Reading Field Notes right through, I did notice some repetition of phrases and snippets of backstory. Being a weekly or bi-weekly newspaper column, this makes sense, but doesn’t work quite as well for cover-to-cover reading. It would be perfect for dipping in and out of. However, this is just a small thing, and didn’t stop me from reading the book right through. Sara Jewell is good at writing about the things that happen, or are there, but that most of us don’t take the time to reflect on. I heartily enjoyed reading her essays with titles such as “The Truth About Roadkill”, “My Husband Knows Jack About Decorating”, “Muslims in the Maritimes”, and “Check Me For Ticks” (which made me think of this song). Warning: This book may make you want to move to Nova Scotia. It does for me, and I already live here. Field Notes is a bi-weekly column in the Amherst Citizen-Record. Another place to find more of Sara’s delightful ramblings about country living is her blog. Thank you to Nimbus Publishing for providing me with a copy of this book for review! Tell me, do you wave to everyone, or is it just us? This sounds like a lot of fun! I’ve read a few books that originated as newspaper columns and also found that they could be repetitive; as you say, picking it up to read the occasional essay sounds like a good strategy. I love your reflections on obligatory waving and talking about the weather. I find English neighborhoods pretty unfriendly. Hardly anyone waves or says hello. Then again, I’ve never lived anywhere very rural. Oh, tell me this is not a perfect Christmas book for a Maritime Mom!? Thanks Naomi & Nimbus. Wonderful review NM! Hand waving is a very Irish thing too. In Donegal people you don’t even know wave at you! Good to hear! And interesting that many of us are from Irish descent. Maybe waving is a thing in Scotland, too (that would be most of the rest of us). This sounds like a fun book! I think I might get it for my mom for Christmas,she used to work for a rural newspaper and loves stories like these. I think hand-waving must be rural, because growing up in rural Ontario we waved at everyone, and still do on the way to the cottage up north. Can’t wave to everyone in Toronto, I’d have a very sore arm… 😀 Now it’s just to people when they let me ease in on the road or turn in front of them. This sounds just right for your mother! It makes sense that the hand-waving would be more rural than urban. I can’t imagine no waving at all in Ontario! Reading about this book makes me want to live in Nova Scotia…. Not sure if I can give up living in Halifax, but I’d certainly like to read about her experiences in Pugwash. I do the same thing. And wouldn’t it be nice to have a house in PEI as well? I really like her point about community-centered activities. I think one of the challenges for our time is to find out how to come together again in our own communities, get to know our neighbors, help one another, feel a part of something bigger. Churches can certainly be a part of that. We weren’t meant to live in such isolation, staring at our phones! Reading that section made me sad, because it’s so true that we’re losing it. But it has also made me resolve to participate in more community events! I love the waving! I was brought up in the country where everyone said hello to each other. Of course, as soon as I could I moved to London. I now live in a small English town masquerading as a city where, occasionally, on my side of the river – even outside my immediate neighbourhood – greetings are exchanged. The nearest I’ve come to the rural waving is when my partner and I had a Citroen 2CV. We all waved at each other! They were rackety old things given to catching fire, I’m afraid. We no longer have one but I do miss that waving! Sounds wonderful! I think many of us Maritimers would fit right in – we do like to tell our life stories to strangers (some of us more than others. And, here, I’m especially thinking of my mother-in-law). And, like I said to Cathy about Ireland, it makes sense because many of us are also of Scottish descent. It took me years to get used to the waving thing. Now I think “Good – let’s freak out some Upper Canadian.” 😉 It certainly seems to unnerve them when you make eye contact and say ‘hello’ on Main Street. Even the ‘summer people’ from Halifax are uneasy about it. I am SO looking forward to reading this!! You could have a lot of fun with the tourists where you live! This one sounds interesting. Having just moved to the country myself, I could probably use some tips. Not so far, although I’ve noticed that in other rural areas. Goodness, I think I own this book. (I’m pretty sure I took it from the little library at work when it was dissolved. I had no idea what it was about, but I couldn’t let them throw it out. Now I wonder which of my coworkers would have an interest in reading this book.) Reading about waving to people reminds me of when I moved to the US. We were “warned” that Americans would always ask us how we are, but not really wanting to know the answer. 🙂 That did take some getting used to, and I still find it strange when two people ask each other at the same time and then neither one actually answers. But what strikes me now as odd is when I go into a store in Germany and the salespeople just stand around without saying anything. I wonder if we ask each other how we are just to have something to say. Like the weather. Because, as you say, it does seem better than saying nothing at all. That would be strange. But, now I’ll be ready for it if I ever go to Germany! Now I’m wondering what book it is that you have – because this one just came out! Have you found it? Ha ha. It does sound like the author has a sense of humor with chapter titles like that. I would like to visit Nova Scotia sometime (as a newbie Canadian) and this book sounds like it has good info in it. Hopefully you’ll eventually find your way over to this side of the country (and me to yours)! What a delightful book, from the sounds of your review! Where I come from, is not waving, but nodding. No one does that where I live now, so I have to remember when I go back to my home town. I’ve always lived in big cities, haha. So I don’t do much waving, but perhaps I may do some nodding like Melanie said. I like the idea of the two-fingered wave, so I may try that! Passing people in the city might be more conducive to nodding or smiling. If you ride the bus, you could try waving to people out the window – what would they think? Thank you Naomi for calling this to my attention! Sounds completely wonderful! Oh no! This sounds fascinating and the bit about waving at people particularly made me smile, but I don’t think I can pick up a book with sad bits about animals. I’d love to have a “does the dog die” kind of website for books, so I could sad animal bits altogether.